Dagenais, Maxime. "The Early American Republic and the 1837–38 Canadian Rebellions". The Canadian Encyclopedia, 24 February 2017, Historica Canada. 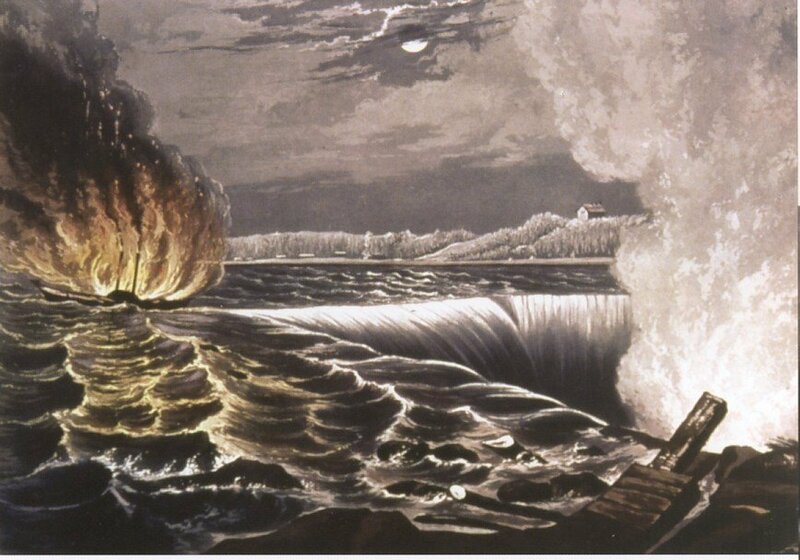 https://www.thecanadianencyclopedia.ca/en/article/the-early-american-republic-and-the-1837-38-canadian-rebellions. Accessed 22 April 2019. In December 1837 and January 1838, in the wake of heavy defeats at the hands of British and Loyalist forces, Upper and Lower Canadian rebels fled to the United States where they sought financial and military assistance. Though the American public was aware that there had been an armed conflict in the Canadas, and many were even initially very supportive, the presence of Canadian rebels on American soil along with growing tensions with Great Britain amid the Caroline Affair forced many to question American involvement. The rebels appeared at a very divisive moment in American history, forcing many to consider the social, political, diplomatic or economic ramifications of the rebellions on the Early American Republic. Though the rebels received support in the borderland, most believed that the United States should remain neutral. 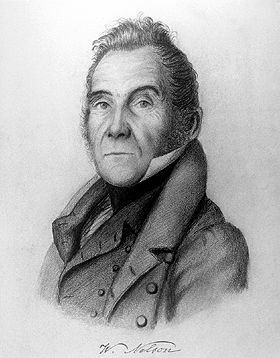 The fiery and principled Scot was the catalyst for the turbulent politics of the 1830s in Upper Canada. Jubilee Souvenir Group of the Patriots of 1837-1838. 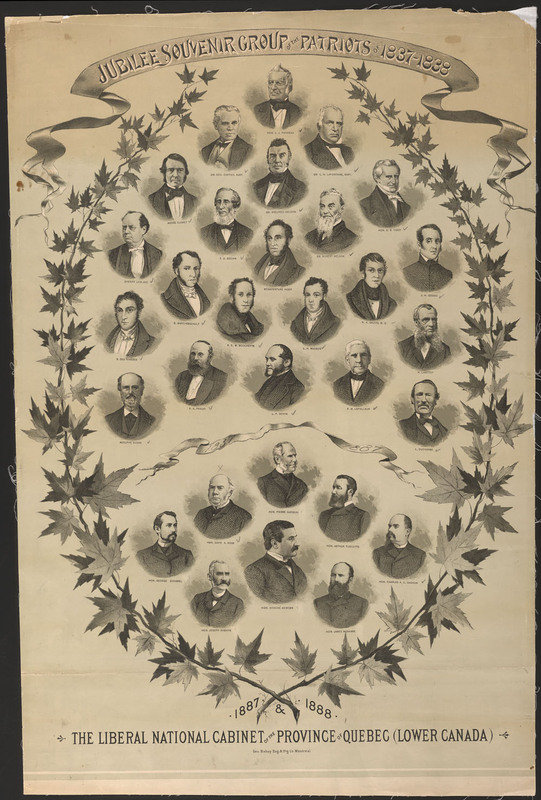 The Liberal National Cabinet of the Province of Quebec (Lower Canada) 1887-1888. Geo. Bishop Eng. & Ptg. Co. 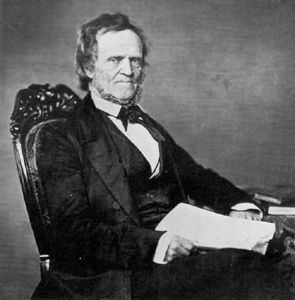 In December 1837 and January 1838, in the wake of heavy defeats at the hands of British and Loyalist forces, Upper and Lower Canadian rebels and rebel leaders, such as William Lyon Mackenzie, Ludger Duvernay and Robert Nelson, sought refuge in American border states. Landing in such states as New York and Vermont, rebel leaders attempted to secure assistance from Americans and worked tirelessly to promote their cause. 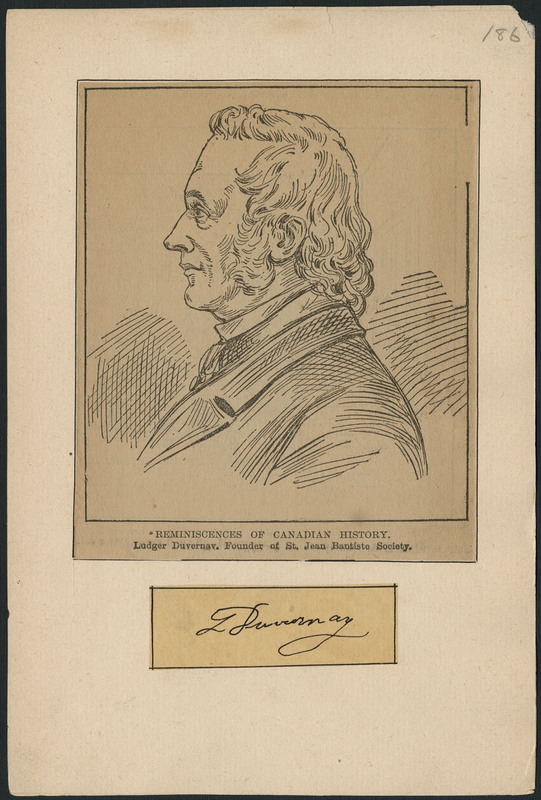 They published newspapers — such as Duvernay’s Le Patriote Canadien and Mackenzie’s Gazette — sent letters to local politicians and merchants and travelled to Boston, New York, Philadelphia and Washington in an attempt to gain financial and military support from the American people and government. The rebellions coincided with a momentous period in American history: the United States was in the midst of the Jacksonian democracy; the Panic of 1837 and the broader economic transformations that some historians have called the “Market Revolution” were causing acute economic anxiety; Texas had seceded from Mexico and its potential inclusion into the United States had divided the nation; and the battles between slaveholders and abolitionists raged on. In this critical context, the demands made by Canadian rebel leaders had significant consequences. Supporting the rebels, for instance, could have a major impact on the United States’ relationship with Great Britain, its economy, or on the battles over slavery. Initially, the rebels enjoyed much support from Americans, especially along the borderland. Borderland newspapers published editorials advocating the rebel cause, locals held public assemblies championing the patriots, and thousands of borderlanders joined secret societies known as Hunters' Lodges, pledging to free Canada from the yoke of British imperialism and assist the rebels in their own “Canadian Revolution.” To many, the rebellions were an opportunity to complete the American Revolution and rid North America of British presence once and for all. Borderlanders still harboured much animosity towards the British, as the impact of the War of 1812 was still fresh in their minds. For example, newspapers such as the Vermont Mercury described the Governor General and his ruling Tory elites as “rabid and unscrupulous instruments” of British tyranny. Support for the rebels stretched beyond the borderland. In major American cities, such as Boston, Philadelphia and New York, several newspaper editors initially sided with the rebels. For example, to William M. Swain and Jesper Harding, two newspaper editors from Philadelphia, the rebel cause was just. Both believed that, like the heroes of 1776 (see American Revolution), the Canadian revolutionaries were also fighting British tyranny. Public meetings in favour of the rebels were held in several major American cities such as Philadelphia, New York, Baltimore, and even as far south as New Orleans. For instance, in early January 1838, a meeting took place at the Merchant Exchange in New Orleans. Presided by E.H. Durrell, all those present expressed much sympathy for the Canadians. One man in particular, a so-called Mr. William, delivered a virulent anti-British speech. He not only suggested that the United States aid the rebels, but also proclaimed — to great applause — that, if successful, the Canadas should be added to the American confederacy. However, in January 1838, as news of an attack on American soil by British and Loyalist forces began to trickle down from the borderland, everything changed, and Americans discovered firsthand the cost of their support. 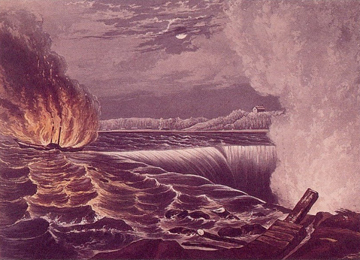 On 29 December 1837, a group of Loyalist and British militiamen, under the leadership of Allan MacNab and Royal Navy Captain Andrew Drew, crossed the Niagara River into American territory, captured an American vessel (the Caroline) rumoured to have been smuggling arms and ammunition to the rebels on Navy Island, set it on fire and cast if adrift off Niagara Falls. To many, war with Great Britain appeared imminent (see Remember the Caroline). On 5 January 1838, in the aftermath of the Caroline Affair, and amid rising tensions with Great Britain, President Martin Van Buren made a general plea for neutrality and asked that Americans — especially those on the borderland — remain neutral. Britain and the United States were at peace, and Americans were not permitted to participate in the rebellion or send weapons and money to the rebels. Van Buren even sent a force under the leadership of Brigadier General Winfield Scott to the Canadian border to ensure that his instructions were followed. He also asked district attorneys in Vermont and New York to remain vigilant and arrest any American caught aiding the rebels. The Caroline Affair was a turning point for many Americans. The threat of war hit close to home and forced many to reconsider their support for the rebellions. Though the rebels maintained support along the borderland, as several Americans would later take part in the Battle of Windmill (November 1838) and the Battle of Windsor (December 1838) — two rebel defeats that concluded the rebellions in 1838 — most Americans sided with the president and believed that neutrality was the best course of action. The rebels appeared at a very divisive and anxious moment in American history, forcing many to consider the social, political, diplomatic, or economic impact of the rebellions on the Early American Republic. As a result, many opted to err on the side of caution and favour neutrality. Tensions between slave states (southern) and free states (northern) were also a decisive factor. One of the most intense battlegrounds in the Antebellum Period — roughly the period between the American Revolution and the Civil War — was slavery. By the turn of the 19th century, calls for the abolition of enslavement came from some of the most prominent members of American society, including Benjamin Franklin and Benjamin Rush. Starting with Vermont in 1777, the northern states abolished slavery. By 1837, 13 states were considered “free states” and 13 preserved slavery. A struggle between abolitionists and slaveholders thus ensued, with both sides trying to influence the nation’s social, political and economic agenda. The creation of the Republic of Texas played an important role. In 1835–36, Americans living in Texas — at the time part of Mexico — revolted against the Mexican government. In the aftermath, the southern slave states hoped that Texas — a slave state — would be annexed into the United States, further increasing their influence. The north was opposed. Two years later, in 1837–38, the Canadas were in a similar position to Texas: they were in the midst of a rebellion, rebels sought independence, and the potential of two independent colonies adjacent to the United States placed them at the forefront of a political debate. Some slaveholders from the southern states were concerned that involvement in the Canadian rebellions was simply a northern attempt to minimize their influence in the United States, and as a result, heavily favoured American neutrality. In 1833, the Canadas had become "free states" after the Parliament of the United Kingdom passed the Slavery Abolition Act banning slavery in the British Empire, with a few exceptions outside North America. Particularly, some pro-slavery newspapers from the south (e.g., the Charleston Mercury), were worried that if the rebels succeeded and the Canadas became independent, they would be annexed to the United States as free states (as opposed to slave states); that prospect would have serious ramifications on debates regarding slavery, as the balance of power would tip towards the free states. To some northern newspapers, slaveholding interests weighed so heavily on Washington that they accused Van Buren of bowing to slaveholding demands when he made his general call for neutrality. By January 1839, the rebellions were over and so was American interest in Canadian affairs. The rebels did not defeat the British and Loyalist forces; the Canadas did not become independent republics; and the Canadas were not annexed into the United States. With more important issues at stake, such as slavery, the annexation of Texas, westward expansion, and a nasty economic crisis, Americans were no longer concerned with Canada and stopped talking about the rebellions. Jean-Paul Bernard, “Vermonters and the Lower Canadian Rebellions of 1837-1838,” Vermont History 58, 4 (1990). Kenneth Bourne, Britain and the Balance of Power in North America, 1815-1908 (1967). John Duffy and Nicholas Muller, “The Great Wolf Hunt: The Popular Response in Vermont to the ‘Patriote’ Uprising of 1837,” Journal of American Studies 8, 2(1974): 153‒69. Daniel Walker Howe, What Hath God Wrought: The Transformation of America, 1815-1848 (2009). Oscar Aryle Kinchen, Rise and Fall of Patriot Hunters: Liberation of Canadian Provinces from British Thraldom (1956). Robert E. May, Manifest Destiny’s Underworld: Filibustering in Antebellum America (2002). Rebecca Berens Matzke, “Britain Gets Its Way: Power and Peace in Anglo-American Relations, 1838-1846,” War In History 8, 1 (2001): 19‒46. 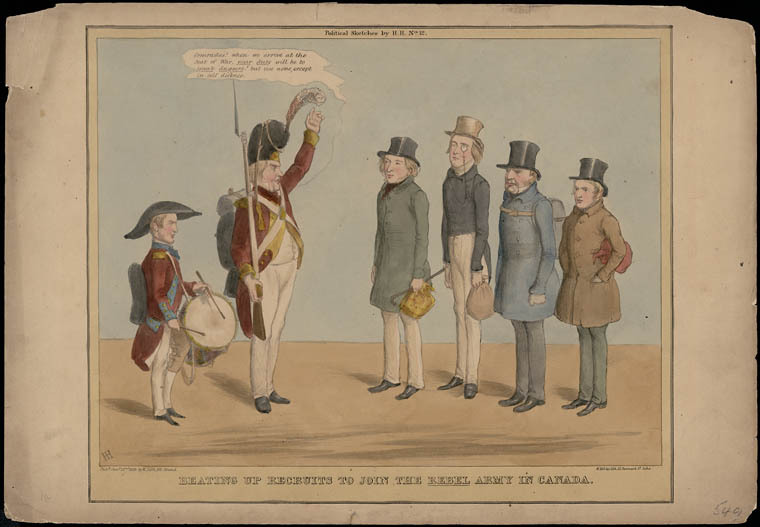 Samuel Watson, “United States Army Officers Fight the “Patriot War”: Responses to Filibustering on the Canadian Border, 1837-39,” Journal of the Early Republic, 18(1998): 485‒519.